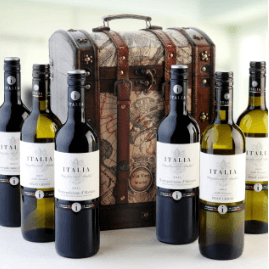 Elegant keepsake chest gift box themed on the world map, you can choose the wine gift from red wine Italia Montepulcian or white wine Italia Pinot Grigio. Italia Montepulciano Italian red wine. Italia Pinot Grigio Italian white wine.